Wok & Roll Video Slot Review - Casino Answers! Wok & Roll is a 5-reel, 25-line video slot developed by Realtime Gaming, featuring a wild symbol, scatter wins, multipliers, two free spins features and two progressive jackpots. You can play the Wok & Roll Real-Series Video Slot at Bovada. 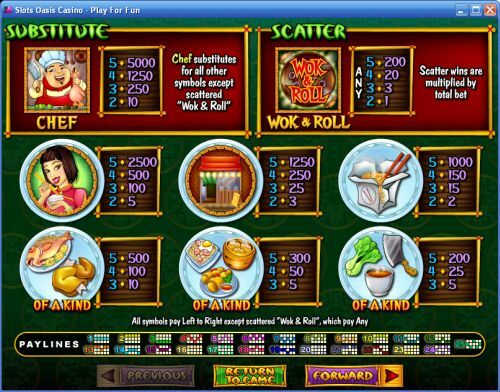 Bets on the Wok and Roll slot machine are $0.01, $0.02, $0.03, $0.04, $0.05, $0.06, $0.07, $0.08, $0.09, $0.10, $0.25, $0.50, $1, $2.50 and $5 per line. You can select from 1-25 paylines on the Wok and Roll slot game. The least you can bet per spin is a penny per spin. The most that you can bet per spin is $125. Wok and Roll has a good betting range that is suitable for casual players and high rollers. You can manually stop the reels via the skill stop feature by pressing the “Stop” button in mid-spin. To play the Wok and Roll online slot, select your bet and press the “Spin” button. The Chef is the top paying symbol on the Wok and Roll video slot. If you land 5 Chef symbols on a selected payline, you will win the 5000 coin top jackpot. The Chef symbol is wild and will substitute for all symbols except for the Wok & Roll Logo symbol. Other high paying symbols on the Wok and Roll slot machine are the Chinese Girl (2500 coins), Restaurant (1250 coins) and Noodles (1000 coins) symbols. The scatter symbol is the Wok & Roll Logo symbol. 2, 3, 4 or 5 Scattered Wok & Roll Logo symbols will pay out 1X, 3X, 20X or 200X your total bet. When 3 or more Scattered Wok & Roll Logo symbols appear anywhere on the reels, you will win 8 free spins. Each free spin will have a 2X, 3X, 4X, 5X or 10X multiplier. If 3 more Scattered Chefs or Wok & Roll symbols appear on the reels during this free spins feature, you will win 8 more free spins. Free spins are played at the lines and bet of the triggering game. You can really wok and roll with big wins by triggering this feature when you play at Bovada! When 3 or more Scattered Chefs appear on the reels, you will win 10 free spins. An Extra Wild substitute may appear during the Chef free spins feature. Whenever an Extra Wild symbol substitutes in a winning combination during this free spins feature, it will act as a 2X multiplier. The Wok & Roll Logo symbol will not appear during the Chef free spins feature. 5 more free spins can be won if 3 or more Scattered Chefs and/or Extra Wild sybmols appear during this feature. Free spins are played at the lines and bet of the triggering game. Wok & Roll has two progressive jackpots – Minor Jackpot and Major Jackpot. These progressive jackpots are currently at $740.06 and $1,003.65 respectively. They are random jackpots so they can be won on any spin you make on the Wok and Roll video slot. Progressive Jackpot wins are added to other wins. Jackpot contribution is no more than 1.5% of total Return to Player. Wok & Roll has an advanced autoplay mode. Hit the “Autoplay” button to open the autoplay settings. You will be able to set the number of spins, set it to stop when the jackpot is won, stop if a win exceeds or equals (any amount you input), stop on any win, stop if your balance increases/decreases by any amount you input and stop once the feature is triggered. You can stop Wok & Roll’s autoplay mode using the “Stop Auto” button to deactivate it. 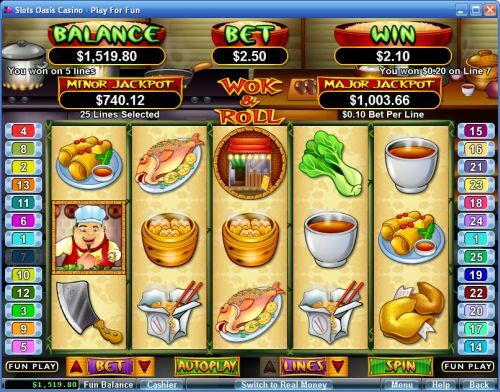 If you are a lover of Chinese food (which should be everybody), you will enjoy playing the Wok and Roll video slot. It has nice comic-style art, animations and sound effects that make for good presentation. It also has two excellent free spins features and progressive jackpots. Aside from that, the fixed payouts are fairly good as well. You can play the Wok and Roll slot game when you sign up and make a deposit today at Bovada! Can players from the United States play the Wok and Roll video slot for real money? Yes, players from the USA are welcome to play the Wok & Roll online slot game for real money at any RTG online casino, including Bovada.